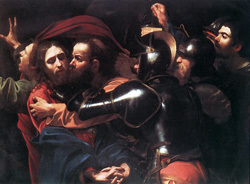 The Taking of Christ (After Caravaggio) • Joe Forkan 2009, oil on linen, 72" x 40"
This painting is based on Caravaggio’s The Taking of Christ painted in 1602. I wanted to combine the gravity of the original painting, (with its dynamic composition and the drama of the moment depicted) with the humor of the movie, and really push the way the figures read with the marks and the use of color. The images in these paintings are derived from scenes in the film, but are built from many frames in a single scene as well as from additional photography and manipulation, reconfiguring the compositions to try to capture the movement and drama of baroque era painting, while thinking of film language and contemporary ideas of painting. 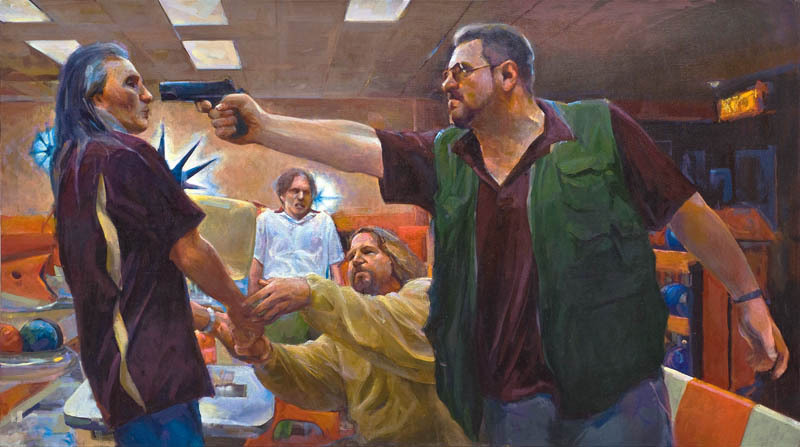 The history of painting and state of painting are also subjects of The Lebowski Cycle. This entry was posted in Figurative Painting & Drawing, The Lebowski Cycle and tagged Caravaggio, contemporary, figurative painting, Jesus, Judas, painting, Pontius Pilate, Roman soldier, The Betrayal of Christ, The Big Lebowski, The Passion of Christ, The Taking of Christ, • The Lebowski Cycle on November 21, 2009 by Joe Forkan.